Optional fillings for the centers of the curls. Suggestions include cherry or grape tomatoes (whole or cut into rosettes), small radishes, carrots carved into cones, and watermelon, cantaloupe, mango, or papaya balls. • Cut unpeeled cucumbers into lengths about 5 inches long. • Carve one end to a 1-inch point so it looks like a stubby sharpened pencil. Angle knife to match the pointed end of the cucumber. Slice a continuous strip about 1/4-inch thick following the angle of the point, just as you might pare an apple or orange in a single piece. Gently stretch out curled strip so you can grasp the ends. It is important that there is no twist in the center. Grasp the ends with the skin side down and simultaneously curl both ends toward the center forming two connected cones. If the strip is too long, simply trim down the ends. The finished cucumber curl should look like this. You may use it as is alone or group several together in a circle for a flowery effect. 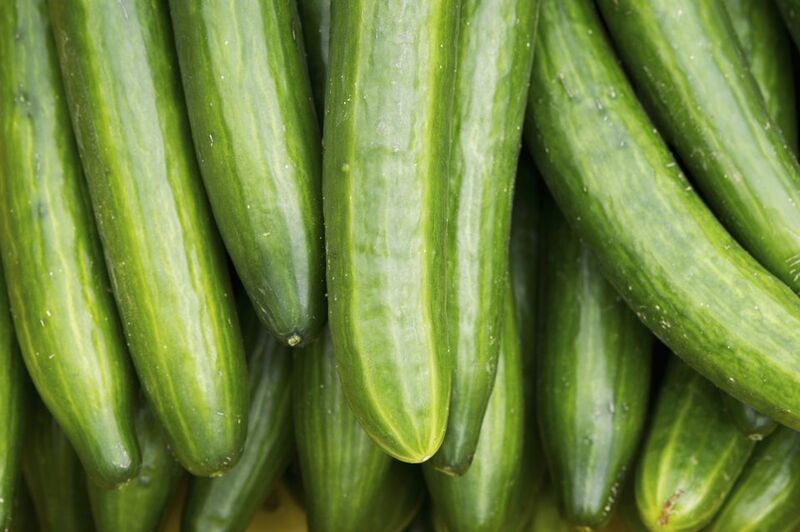 Go on to the next step for ideas on further enhancing your cucumber curls. Filling the centers of the cucumber curls gives, even more, interest. Colorful suggestions include cherry or grape tomatoes (whole or cut into rosettes), small radishes, carrots carved into cones, and watermelon, cantaloupe, mango, or papaya balls.